The Yes Men are a pair of corporate hoaxers with essentially just one trick up their sleeve; they are middle aged white men. Along with this attribute, fake websites and business cards, they are able to pass themselves off as representatives of corporations they feel have wronged many people. This allows them to make claims and promises on behalf of the companies they falsely represent. These are all fantasy claims, or sometimes just absurd jokes. The human protection suit was created as a gag to be presented as a homeland security option at a conference, but the film does not have the laughs you may expect from this scenario. The problem is that most people seem all too willing to believe the absurd notions that The Yes Men come up with. The most shocking things that they do are offer reparations to disaster victims on behalf of the corporations. A company giving rather than being a greedy beast is too hard for some reporters to believe, and occasionally the pranksters are caught before they even have a chance to flee. 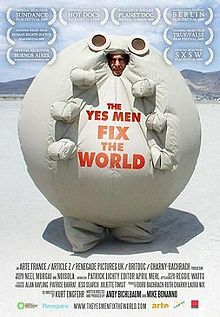 In 2004, Yes Men Andy Bichlbaum and Mike Bonanno released their first documentary about their pranks. It was a tighter film than this one, but not nearly as impassioned. There are sequences of the film which may not carry the humor from the past film, but instead carry a sincere plea for a revolution against greed. This is just another way of using the documentary film, showing that it is possible without shouting the point with a bullhorn like Michael Moore.